Paul Nash was our best landscape artist of the 20th century — so why is Tate Britain calling him an international modernist? Paul Nash died in 1946, so that should have been that, but reputations are immortal and Nash’s posthumous one has been manhandled into various shapes. Most of us treasure him as a landscape artist, one of the finest, a subtle painter with a subtle understanding of the subtle beauty of the British countryside. Just recently, though, during the nationwide commemorations of the outbreak of the First World War, it was Nash the war artist who was raised to the podium, with his fierce pictorial condemnations of conditions in the trenches. Now I see that curators at Tate Britain are proposing a third model: Nash the international modernist, whose Britishness has been overstated and whose internationalism is underappreciated. This effortful agenda is blurted out on a wall text at the start of a beautiful Tate Britain show devoted to Nash that is also daftly confusing. Instead of a helpful biography, the opening text gives us: “Paul Nash (1889-1946) was a key figure in debates about British art’s relationship to international modernism.” What kind of an introduction is that? A key figure in debates? Come on, curators. Nash was so much more than that. He was the greatest British landscape artist of the 20th century, and his deeply personal understanding of the countryside as the locus for forces that are ancient and mystical was as endemic as it was persistent. Your own show proves it. The clunky effort to position Nash in an international modernist context is the kind of thing Tate Britain is keen on these days. The sense persists here that, rather than celebrating the uniqueness of British art — which is surely what the museum was set up to do — the Tate is embarrassed by it and seeks to downplay it. I’m not a Brexiteer. I’m Polish. But even to me it’s as clear as the daylight in a summer view of Dorset by Paul Nash that this museum needs to love Britishness more. What the show ahead actually proves is that Nash was insistently, unwaveringly local in his vision. Most obviously in his landscapes, but also in his still lifes, which are just as enchanted, and which originated in the same dark fairyland. The first drawings by him here, done in 1910-12, are mysterious night scenes produced under the obvious influence of Samuel Palmer. Like Palmer, the young Nash had an appetite for moonlight — the suspense it creates and the dreams it encourages. In one landscape, an ominous female shadow falls across a moonlit clifftop. In another, the waves in the sea turn miraculously into the pyramids. All this is an escape from the quotidian. The rules of the night, you feel, suited him better than the rules of the day. Night was an escape, not just from modernity, but from the unhappiness of a dark home life, overseen by a mother who was going mad and who died at the age of 49 in a psychiatric institution. I mention it here because the show doesn’t. So determined is it to direct us up the path of Nash’s international modernism that it ignores the evidence of its own eyes. What they have got here are some fabulous loans. Having introduced us to a young and fey dreamer who imagined strangeness in every clump of British trees, the show explodes into true seriousness with his great and dark art of the First World War. Sent to the front in 1917, Nash had all the pre-Raphaelite whimsy torn out of him by the horrific reality of the trenches. The huge painting that dominates his first war room, The Menin Road, from 1919, feels as if it has been crashed into the exhibition, rather than selected for it. It’s so suddenly harsh, so suddenly powerful. Across a gigantic expanse of mud, painted in his trademark greys, browns and beiges, a few tiny figures dodge between the broken stumps that rise out of the wasteland like burnt-out matches: the remains of the trees. It’s a vision of apocalyptic devastation. The angular simplifications that Nash employs to create the landscape — the hard edges, the triangles — have been borrowed from cubism, but their effect here is to introduce the dangerous mood of broken glass to the scene: slashing and nightmarish. What a masterpiece. The next room is filled with the bleak landscapes Nash painted on his return from war. Date-wise, the conflict was over. Emotionally, it had seeped into his bones, a quintessential British dampness expressed from now on in faded greys and tired pinks. It’s a lovely colour scheme, but it always looks sad and faded. The views of the shore at Dymchurch are the most forlorn sea views you will ever see. And look how the concrete slabs of Dymchurch’s sea defences seem always to be expressing a kinship with wartime bunkers and zigzag trenches. 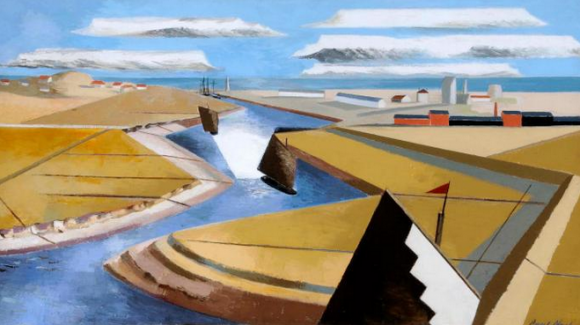 It’s only now, having convinced us of Nash’s specifically British genius as a landscape painter, that the show remembers its agenda and gets down to the international modernist bit. The tricky still lifes he painted in the late 1920s and early 1930s are undoubtedly influenced by continental surrealism — by de Chirico, Ernst, Magritte. Windows become paintings. Easels become rooms. Flowers become personages. But they do all this with a cosmic seriousness that you just don’t find in other people’s surrealism. On a scale of one to 10, international surrealism scores three here, but Britishness scores nine. From now on, the show loses its way as an argument. The dampness persists, and so do the cup-of-tea colour schemes. In Swanage, Nash becomes a typical British beachcomber finding strange concurrences among the pebbles, the bones and the driftwood. How determinedly he searches for the transportative ecstasy that turns the ordinary into the extraordinary. He saw through plainness and disputed it. Quiet things become powerful in his art, and simple things become complicated. No other national school sought what he sought. In room after room, the show’s agenda is challenged by the evidence of the art itself. Another important artist working in these years, in whom the relationship between nationalism and international modernism became an issue, was the Belgian James Ensor (1860-1949). Like Nash, Ensor was strikingly, emphatically endemic: fully Belgian in his territory and his touch. And, like Nash again, he, too, is now the victim of a half-baked exhibition strategy that adds nothing useful to his achievements. The Ensor show at the Royal Academy has been “curated” by his fellow Belgian Luc Tuymans, a painter of recurrently pale canvases that I do not rate very highly, but that others do. 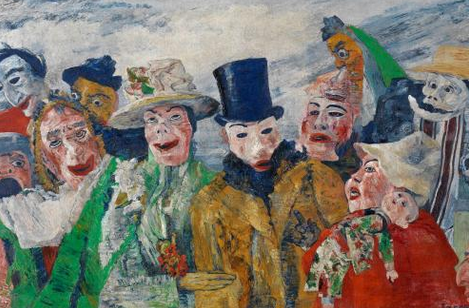 Not content with introducing the little-seen Ensor to British audiences, Tuymans pads out the display with his own work and that of his contemporaries. Their contributions are pointless and, predictably, Ensor shows them all up. Born in Ostend into a bleak and bourgeois 19th-century darkness that he captures perfectly in his first paintings of his family, Ensor was unbalanced in a very Belgian way. He hardly ever left Ostend, and the self-imposed isolation turned him into a sour, angry presence. Everything he painted, he seemed to disapprove of. Including himself. In one self-portrait, he gives himself a grinning skull for a head. In another, he wears a ludicrous flowery hat that belongs on Marie Antoinette. Everything is sent up with a bitterness that never relents. What to make, as well, of his weird religiosity? In one huge Wagnerian painting, a giant angel in the sky is seen chasing Adam and Eve out of Paradise. (It’s actually Belgium standing in pathetically for Paradise.) In another, he gives us a gnarled and ghastly Man of Sorrows who is both Christ and, you sense, Ensor himself. The best work in the show is the sequence of paintings from the fin de siècle featuring figures in masks. The Intrigue, painted in 1890, confronts you with a crush of escaped loonies: grimacing, lurching, laughing and heading straight at you. It’s a mirror. The loonies are us. As an image of fin de siècle disquiet, The Intrigue is up there with Munch’s Scream. To see the human condition this clearly, isolation is probably a prerequisite, not an obstruction.